The latest Pokémon GO Community Day is upon us! Community Days are monthly worldwide festivities dedicated to celebrating Pokémon GO’s vast community of Trainers who have helped make the game such a phenomenon. 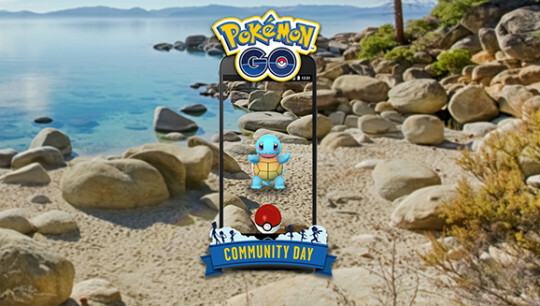 This month’s Pokémon GO Community Day will be held on Sunday, July 8, 2018, and Squirtle will be the featured Pokémon of the day. During a three-hour window that day, wild Squirtle will appear with much greater frequency than normal. You’ll want to catch as many as you can during that time period. Squirtle evolves into Wartortle, and if you evolve a Wartortle into Blastoise during those three hours, it will know the attack Hydro Cannon! Only Blastoise that evolve or are caught during the Community Day festivities will learn this awesome move. Plus, you may have a chance to encounter Squirtle sporting sunglasses—protecting themselves from the summer rays—if you complete Field Research tasks during Community Day! In addition to all the Squirtle excitement, during the event hours, all Eggs will hatch four times as quickly. Plus, Lure Modules will remain active for three hours, helping Trainers get the most out of the occasion. Check below to find out when the event hours fall in your region of the world. So stock up on Poké Balls, get your Lure Modules ready, and prepare to meet up with fellow Trainers to celebrate the Pokémon GO community! When you share your experiences on social media, remember to use the hashtag #PokemonGOCommunityDay so everyone sees your accomplishments. We’ll see you on July 8!